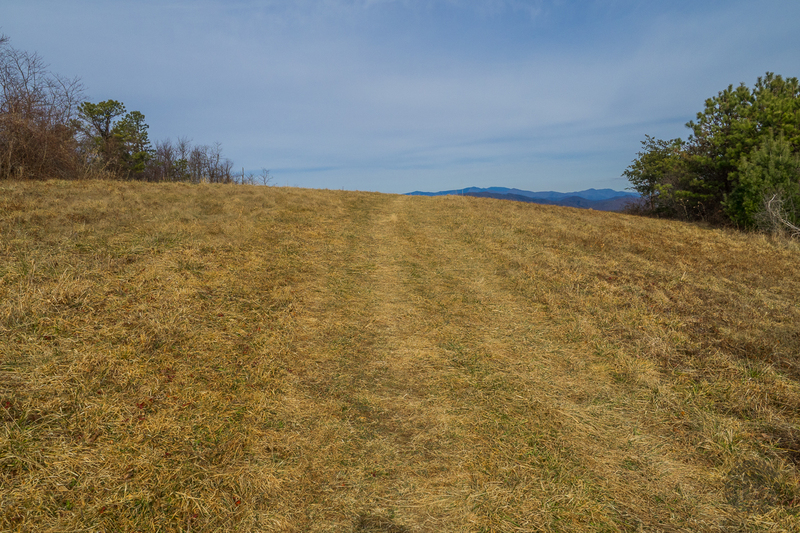 Blue Ridge Pastures is a grassy knoll northwest of Bearwallow Mountain along the Buncombe/Henderson County line. With terrific views of Hickory Nut Gorge, and on clear days The Great Craggy and Black Mountains, the reward for your hard work pays off. The Trombatore Trail will make you climb twice for your reward, once before and once after, but keep that reward in mind as you trod along this brand new 2014 addition to the Hickory Nut trail system. The trail passes through the Upper Brush Creek watershed and along the Eastern Continental Divide on its way to the scenic summit. We hiked Trombatore on Friday, December 19, 2014 between 10:30AM and 2:00PM. Our plan was to explore this new trail we had heard about through the Carolina Mountain Land Conservancy. Blue Ridge Pastures was a big hit with us. Hike Rating: Moderate. Lots of climbing, though not excessively steep. Trail Condition: Very new. Needs some breaking in, but it will be a good one. Starting Point: Bearwallow Gap on Bearwallow Mountain Road. Trail Traffic: We encountered five other hikers, all on our way back. How to Get There: From the Gerton, NC Community Center go west on Hwy 74A about a quarter mile to Bearwallow Mountain Road and turn left. The road becomes gravel, and gets steep and washboardy. From Hwy 74A it’s 2.1 miles to the parking area at Bearwallow Gap where the road turns back to pavement. The trailhead is on the west side of the road. If you’ve been to Bearwallow Mountain before, well, park the same place. The Trombatore trailhead is right across the road from the Bearwallow trailhead at Bearwallow Gap. It’s kinda spartan at the moment… the trail is brand new after all. The sign board is in place, but is empty. Named for a family that lived on the mountain a long time, the Trombatore Trail is configured like a “V.” You start out significantly down, into the Upper Brush Creek watershed. The trail-building volunteers affiliated with Carolina Mountain Land Conservancy and DRAFT Crew have done a nice job with water bars, switchbacks and stairs to help prevent erosion along the new downhill track. Keep your eye out for occasional weird trees in the woodlands, including one that looks like a chicken leg with knuckles, and a 150-year-old covered with burls that somehow avoided the logger’s axe decades ago. In lieu of blaze marks, CMLC has posted temporary signs along the path to guide your way. In many areas the Trombatore Trail borders private property, so keep to the signed walkway to avoid angering local homeowners. When you cross the creek at roughly a half mile, you have reached the bottom, and start the upside of the “V.” Another half mile later the single track trail meets an old road bed that will take you the rest of the way. Watch for the temporary signs at various junctions. If you’re ever hiking around Western North Carolina or the Smokies, and happen upon a very tall man with a beautiful black-and-tan hound named Grace, be sure to stop and chat awhile. Griztrax, as he is known in the hiking community, has many tales to tell. He is always happy to share them with you. The final mile and a half is all uphill, some fairly strenuous, so take your time and pause occasionally to enjoy the forest that surrounds you. Across the drainage is the western shoulder of Bearwallow Mountain, and the craggy cliffs of Face Rock. I looked for a face in the curves of the rock, but couldn’t conjure an image. Perhaps you will have better luck. This old logging road is quite nice to hike on, much of it cushiony grass. Past the 2-mile point you cross a spring and reach the remnants of an old homestead. There are piles of rock scattered about that mark the foundation ruins of a cabin that once stood here surveying the mountains surrounding Asheville, far to the northwest. I couldn’t be sure, but there even looked to be a few heirloom apple trees mixed among the hardwoods and brush. Beyond the homestead, the trail goes single-track again, then reaches the edge of a large meadow. There is barbed wire here, so be aware, but CMLC has provided a wooden stile to safely cross. Dave and I took turns holding Grace as we climbed the stile, so we could help her get through the rusty barbs without injury. Another few hundred feet later we arrived at Blue Ridge Pastures. There is something invigorating about sunshine on a grassy bald in the mountains. With the ridgelines of Hickory Nut Gorge looming all around, you might just feel inclined to let out a yodel or two. As soon as our feet touched the soft highlands grass, large smiles replaced the sweat on our faces. It’s still another tenth mile to the knob on Blue Ridge Pastures, but be sure to spin around and take in the scenery. Behind you is Bearwallow Mountain, topped with the old communication towers from years gone by. To the east is Hickory Nut Gorge, with the massive stone face of Rumbling Bald clearly evident. You can also see Little Pisgah and Burntshirt Mountains. On the north end of the pasture is a fire pit surrounded by logs to sit on. For us, it was a great spot for lunch and relaxation. Despite high clouds, we were treated to a clear lower sky so we could make out the Great Craggy and Black Mountains way off to the north. What a great spot this is. We were energized by the environment. Even Grace had an extra bounce to her step. We made ourselves totally comfortable (see the photo of Dave and Grace at the top) as we fell into the moment. Blue Ridge Pastures is a 120 acre conservation easement secured by the Southern Appalachian Highlands Conservancy in December, 2012. The property is situated on the Eastern Continental Divide, adjacent to Strawberry Gap and Ferguson Knob, with an upper elevation of 3,740 feet. The tracts are adjacent to a network of protected land in Hickory Nut Gorge, including SAHC’s Hickory Nut Gap Forest and CMLC’s Florence Nature Preserve. All of this conserved land will eventually be joined in the Upper Hickory Nut Gorge master plan. Those of the next generation will be in for a masterful treat. The only bad news with a “V” hike is you have to do the climbing all over again. So it was all the way down, then all the way back up on our return. It was OK though because we still had marvelous thoughts of Blue Ridge Pastures dancing in our heads. We encountered three different groups of hikers on our way back, out to enjoy the warm afternoon, a nice December surprise. Save a little energy for the final push back to the trailhead. 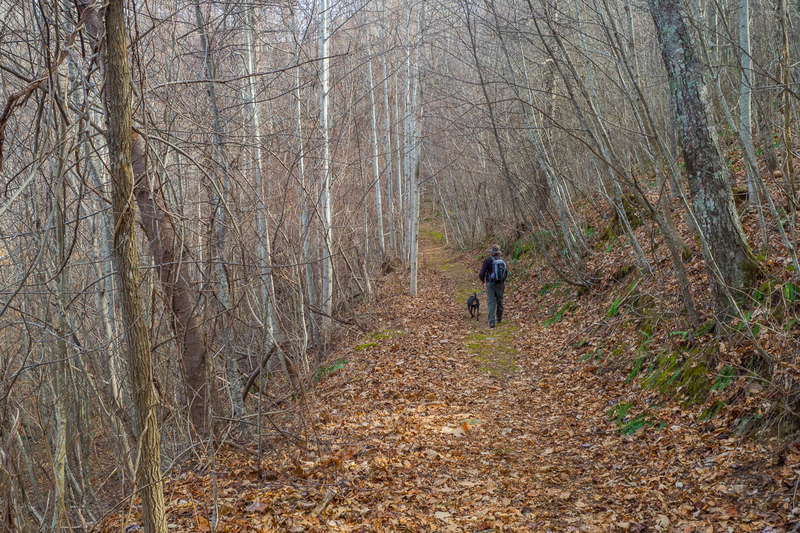 In summary, the Trombatore Trail is a welcome addition to the ever-expanding opportunities for exploring Hickory Nut Gorge. The north gorge offers marvelous vistas of the surrounding mountain ranges, like the views enjoyed from Blue Ridge Pastures, Bearwallow Mountain, and the Florence Preserve. I highly recommend this hike for old and young. It may be a little tough for toddlers, but certainly bring your older kids along. They’re bound to enjoy the expansive scenery. Updated January 7, 2016: It’s been just over a year since first trying out Trombatore Trail. An unseasonably mild January day seemed like a good time to go back for another look. The trail itself hasn’t changed much in a year, and the same laminated signs are still nailed to the same trees. Trombatore Trail needs a few more years to mature and come into its own, but it’s hard to beat the reward at Blue Ridge Pastures… simply stunning views in every direction. Here are another dozen photos.